They cancelled it as a regular show, but they left open the option of doing a stand-alone episode for things like RWBY. I think the whole concept of TTV Talks was lumped into the regular podcast. Either way I would like to see some discussion about RWBY Volume 4. I see what you're saying, but not all of them watch RWBY. It'd be hard to do it on the podcast proper. @Mesonak, what were your thoughts on Volume 4? Did you enjoy it, or did you not think it was good enough? I'm thinking this is mainly due to the fact we're on a RWBY hiatus. I just want to know when the music for Volume 4 will be released. I really do enjoy the music from this series. That's stuff cut from the show, however, not the full versions for all of them, or the episode tracks. For example, Let's Just Live. The song, taken directly from the show, is about a minute and a half, as are all the other RWBY opening themes, until you go to the soundtracks, where they're normal length. Not to mention This Life is Mine, in which case I would be sorely disappointed if it were naught but a 58 second song. According to the Amazon listing, it's due June 6th, and so is the DVD/Blu-Ray release. These could change, however. That's far too long from now for my liking. Not getting my hopes up too much, though it's still exciting. The chat log is dated February 12th, so this could just be an old unconfirmed date. Eh, we'll see. 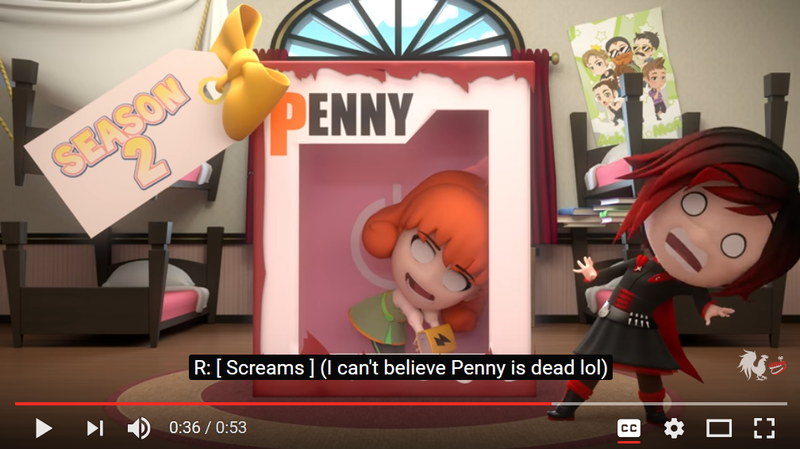 The return of the awesome subtitles! Hurrah!